The amount of protein you need in your diet depends a lot on your body weight and what activities you do. More protein is not necessarily better. Americans in general eat far more protein than we need each day.The RDA for protein is .8 grams per kilogram of body weight. So, if you weigh 140 pounds, you’d need 51 grams of protein per day (140 pounds = 63.5 kg, and 63.5 X .8 = 50.8). This might be higher if you are incorporating a vigorous weightlifting routine into your schedule, but regardless, it is not only possible, but easy to get enough protein on a daily basis while following a vegan (or plant based) diet! Protein is made up of amino acids, often described as its building blocks. We actually have a biological requirement for amino acids, not for protein. Humans cannot make nine of the twenty common amino acids, so these amino acids are considered to be essential. In other words, we must get these amino acids from our diets. We need all nine of these amino acids for our body to make protein. Eating a variety of unrefined grains, legumes, seeds, nuts, and vegetables throughout the day will make sure we get everything we need, so if one food is low in a particular essential amino acid, another food will make up this deficit. A strict protein combination is not necessary, it is more important to eat a varied diet throughout the day, and it is here that many, who have attempted a vegan diet, have failed, and often come to their own conclusion that they got “tired or anemic” or experienced some other type of deficiency when trying to adopt a plant based diet. Nearly all vegetables, beans, grains, nuts, and seeds contain some, and often a lot, of protein. Fruits, sugars, fats, and alcohol however, do not provide much protein (or nutrients for that matter) at all, so a diet based only on these foods would have a good chance of deficient in protein (Hence, there are a lot of “unhealthy” vegans out there who live on candy, beer and bread alone… not a good idea). 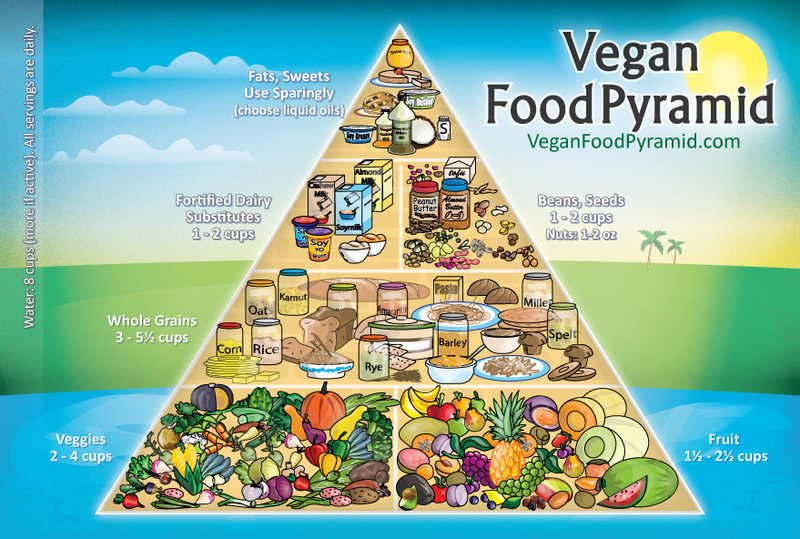 Vegans eating a varied diet containing vegetables, beans, grains, nuts, and seeds rarely have any difficulty getting enough protein as long as their diet contains enough energy (calories) to maintain weight. (source: The Vegetarian Resource Group). Most plant based foods are in general less calorie dense so eating enough is very important. Luckily I don’t have a problem in that area, as I generally have a huge appetite, which follows my active lifestyle. So how do we combine a meal to ensure we get enough protein, carbohydrates, healthy fats, vitamins and minerals? Here’s is a recipe that will get you well on your way. This Moroccan vegetable stew, when served with quinoa, is packed full of full of protein. For example 100 grams of quinoa contains 14 grams of protein. Add to that the chickpeas (19 grams of protein in 100 grams of chickpeas) and this is a perfect dish after a tough workout, for example – when you need to fill up on carbs. 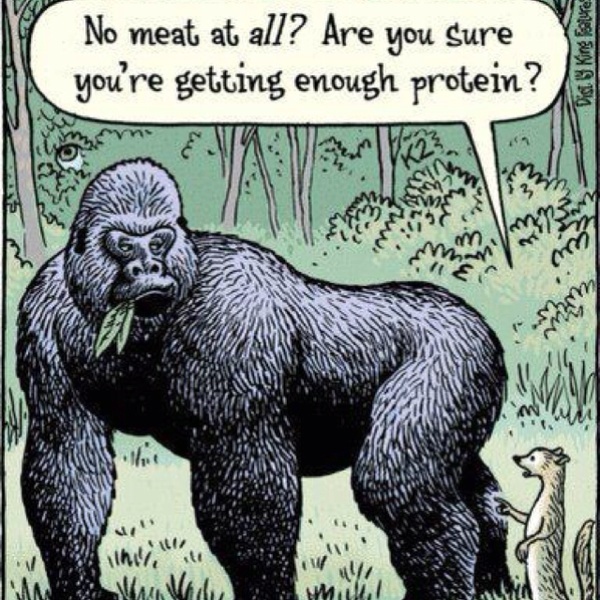 Who’s lacking protein now?? 1. Place the onions and garlic in a large saucepan with a little good quality olive oil over medium heat and saute until translucent. 2. Add the spices and cook, stirring frequently until fragrant. Add a little water if the mixture is too dry. 3. Add the apricots, carrots, sweet potatoes, eggplant and potatoes to the pot and cook for 5 minutes. Stir now and again. 4. Crumble the stock cubes into the pot and then add the water and the can of tomatoes. The vegetables should be covered by the liquid. 5. Season with salt and pepper. Bring to the boil and then simmer for 50 minutes to one hour. 6. Rinse the chickpeas and add them to the pan. 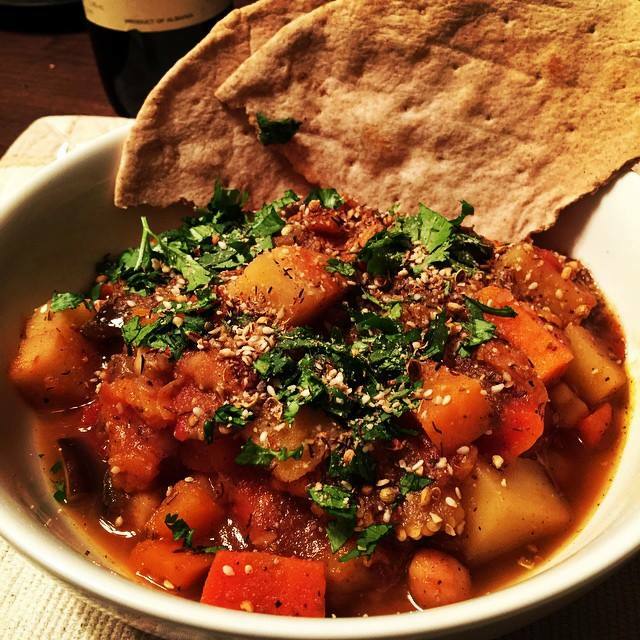 Heat the Moroccan vegetable stew until the chickpeas are warmed through. 7. While the Moroccan vegetable stew is cooking rinse the quinoa in a sieve under cold running water. Place in a pan and cover with 2 cups of water. Bring to the boil and then simmer gently until all the water is absorbed. It is just fine to let the quinoa stand, covered, in the pan for up to 15 minutes. Fluff it up with a fork before serving. 8. Serve with the quinoa and sprinkle with chopped cilantro (fresh coriander) and dukkah. Dukkah is an Egyptian spice mix, that typically consists of toasted spices, nuts, seeds and sometimes fresh herbs. You cn sprinkle this on most any dishes like salads, soups, stews, tofu, tempeh for a flavor packed meal. This makes a batch you can use for many meals. Store in an airtight container for up to 1 month. 1. Place the coriander, cumin and sesame seeds into a heavy bottomed skillet (frying pan) and set over a high heat. Keep moving the seeds around in the pan to prevent burning. When a delicious fragrance floats up from the pan, tip the seeds onto a plate to cool. 2. Add the pistachios to the pan and toast them over the high heat. 3. Now put all the ingredients into the goblet of a blender (Vitamix) or food processor and whizz for a few seconds. 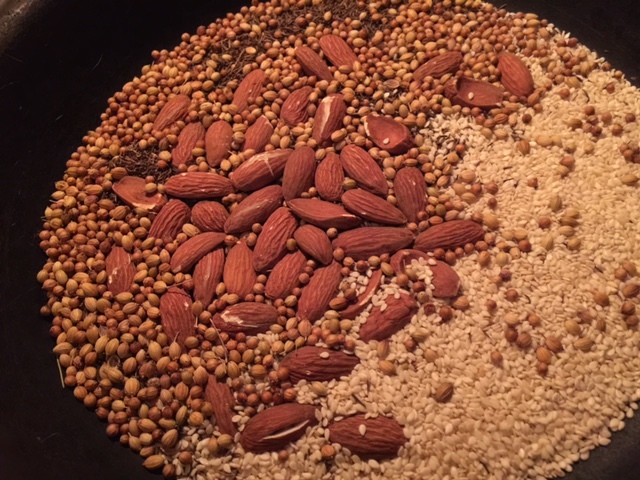 This is just to combine and chop the nuts and seeds a little. Take care not to pulverize the ingredients. 4. Store in an airtight glass jar. Oil Or No Oil? That Is The Question. Plus Two Delicious Salad Dressing Recipes. Add Some Spice To Your Life… and Food! Reblogged this on Vegan Bikini Doc.